Gas services are vital sources of heating and cooking for caravans and motorhomes – especially in the winter months. Here are the fundamental considerations all caravanners and motorhomers should be aware of. What sort of gas should you use? The most commonly used varieties of LPG for leisure use are propane (C3H8) and butane (C4H10). These are gases at normal temperatures and pressures, but can be liquefied by the application of a relatively low pressure. 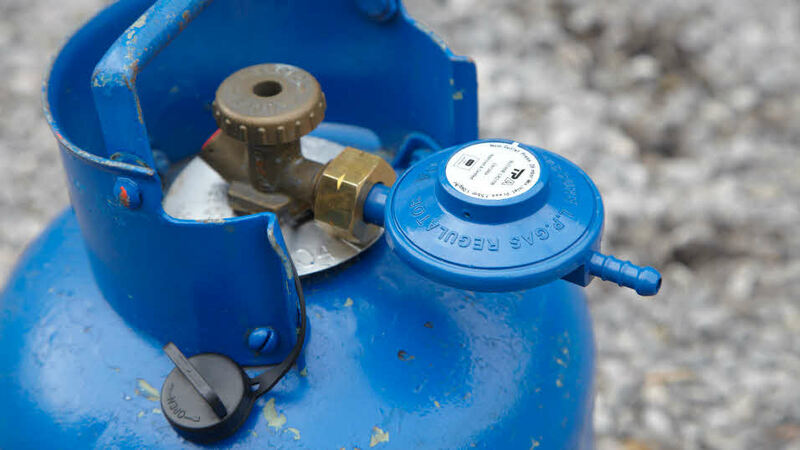 Because a small volume of liquid equals a very large volume of gas (l to 274 for propane, l to 233 for butane) a small pressurised cylinder can contain a significant amount of 'energy' for your caravan appliances. Butane will only readily change to a gas above 0˚C, so is generally suitable for the spring to autumn caravanner. Propane, on the other hand, will become a gas down to -40˚C and, therefore, can be used in winter, or all year round if desired. Propane is often sold in red cylinders, butane in blue, but some suppliers use alternative colours – always check which gas you are buying. Until September 2003, different regulators were required, depending on which gas was being used - butane being regulated to 28mbar and propane to 37mbar. The introduction of the EN1949 European Standard for 2004 model-year caravans (from September 2003 in the UK) then harmonised pressure for both gases as 30mbar, meaning a single regulator now suits both propane and butane. EN1949 allows for either bulkhead or cylinder-mounted regulators. Most caravan appliances operate happily on either butane or propane. The most common brand of LPG in the UK is Calor, with a broad range of 4.5kg, 7kg and 15kg butane cylinders. Propane users have the choice of Calor's 3.9kg, 6kg and 13kg cylinders. Not all Calor stockists will have the 6kg Propane, so check first by calling free on 0800 626 626. Calor also offer “Calor Lite” 6kg propane cylinders, with the same screw connections as standard propane cylinders, but a reduced cylinder weight. Calor cylinders are stocked on most Club sites. Please note: Calor have announced the phasing out of their 6kg Lite propane gas bottle from mid-2017. For details, please see the advice on the Calor website. Several other brands are available too – one of the most popular is the “Gas Light” lightweight plastic cylinder, available in 5kg and 10kg propane capacities. Gas Light uses a 27mm clip-on connection, as is used for patio gas cylinders, but you may need to modify your gas locker to accommodate the slightly wider cylinders. These cylinders are all ‘exchangeable’, i.e. when empty, you return the cylinder to a stockist, who exchanges it for a full one, with you paying just for the new gas. Most suppliers operate a hire agreement on cylinders, which remain their property. Keep the original hire agreement safe, because if you want to return the cylinders at any time, you will get a proportion of the hire fee back. The hire form may also be required if you wish to switch cylinder sizes, or from butane to propane. An alternative to exchangeable cylinders are ‘user-refillable’ cylinders or tanks. These are sometimes found on motorhomes, and less commonly on caravans. In principal, these appear to be a good idea, as they can be refilled at petrol stations selling ‘Autogas’ for LPG-powered cars, which is cheaper than ‘cylinder’ gas. However, the equipment is often quite expensive to buy so it really only suits those who will use quite a lot of gas during a season. Some filling stations are reluctant to allow user-refilling, especially of cylinders which cannot be refilled in situ by means of external filler. We advise against user-owned, portable LPG cylinders refilling at Autogas refuelling sites. We also discourage the practice of using a large free-standing propane cylinder outside the caravan is not recommended for safety and security reasons. Because of its highly flammable nature when mixed with air, certain basic safety guidelines should be followed whenever dealing with LPG. LPG is non-toxic and has no smell - the characteristic gas smell is added to help detect any leaks. Leakages are most likely to occur at connection points such as the regulator, valve or flexible hose. Gas hoses will inevitably deteriorate with age, so they should be inspected for wear and damage and replaced from time to time. Low pressure hoses are most vulnerable, and should be changed every three years. If a leak is suspected, never look for it with a naked flame. The best method is to brush a solution of washing up liquid over the suspect area or use a gas leak detector spray; any leak should show by bubbles or foam appearing in the liquid or spray at the source. Your caravan or motorhome should have ample ventilation holes through the floor. Never attempt to dismantle or repair a defective cylinder valve. Regulators would normally be expected to give many years’ service, but if exposed to extreme conditions (for example if water condenses inside then freezes) they can fail. If travelling overseas for long periods and reliant on gas, it’s wise to carry a spare regulator, as it may not be possible to get a UK-specification replacement quickly. In previous years, however, many Club members have reported failures of bulkhead-mounted regulators, due to blockage by a yellow, oily fluid. Once contaminated in this way, the regular must be replaced. Changeover valves allow two cylinders to be connected to the gas system at once. Some systems allow manual changeover from one cylinder to the other, but most change automatically as the first cylinder becomes empty. This reduces the risk of running out of gas on a cold, wet night. Make sure any chosen valve is compatible with your regulator before buying. Patio gas is simply LPG (propane) sold for use with barbeques and patio heaters etc. Most cylinders use a 27mm clip-on connection. You will need a suitable regulator or connecting hose/adapter, and should check the cylinder dimensions are suitable for your gas locker. LPG leaks are usually self-apparent due to the pungent odorant added to the gas. Various electronic devices are also available to warn of leaks. Similar devices are also available to detect carbon monoxide (CO). While dangerous levels of CO are very rare in caravans and motorhomes, this is a risk if an appliance is malfunctioning. The gas system and appliances must be kept in good working order for safe and reliable functioning. An annual service carried out by an Approved Workshop will include a functional and safety check, but will not generally cover detailed appliance servicing. Owners should arrange this separately, based on the usage the appliance gets, or according to the manufacturer’s recommendations. Gas Safe registration (the body which has replaced CORGI) is not required unless the vehicle is going to be hired out, and such registration does not necessarily indicate competence with caravan LPG installations. CITO (the Caravan Industry Training Organisation) specifies that the minimum competency requirement for work to be carried out on trailer caravans and motorhomes is an ACoPs (Approved Code of Practice) qualification (this is a requirement for membership of the Approved Workshop Scheme). ACoPs is a minimum standard and can be used as a ‘stepping stone’ to advance to ACS (Accredited Certification Scheme) level. The Club does not recommend DIY servicing and maintenance for gas equipment. Don’t cook or barbecue in an awning, tent or garden gazebo unless it has been specifically designed to include a cooking area. Make sure the cylinder is securely restrained in an upright position during transport. Position the cylinder and barbecue so neither is likely to topple over. Place the barbecue well away from the caravan. Check the gas hose and regulator condition regularly and replace the hose every two to three years, or sooner if deterioration is apparent. Check the location of the gas outlet and the hose length attached to the barbecue are sufficient to allow adequate separation of the barbecue from any flammable structure. Ensure the gas hose is in good condition, especially where it attaches to the caravan outlet. Ensure the gas hose is not a trip hazard. Do not join lengths of gas hose together. The isolating valve for the gas outlet should be automatic so that gas cannot be released when a hose is not connected. However, check the isolating valve is fully off whenever the barbecue is not in use. If travelling abroad, alternative local suppliers are available, but you will probably need an alternative regulator or connecting hose/adapter. Campingaz are the only UK supplier to also have outlets in Europe selling the same specification of cylinder. Never attempt to have Calor or other cylinders not designed for user-refilling refilled abroad.